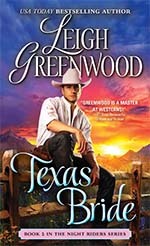 Romance author Leigh Greenwood has been steaming up the pages of historical romances for more than twenty-five years, and the future is looking just as hot! Leigh invites you to have a look around and stay as long as you want. Read about his award-winning series The Seven Brides, The Cowboys, and the recently completed Night Riders. There are plenty of other books so check out the other pages and head to the bookstores or the Internet to fill in your collection or to start one! Read about how Leigh got started writing romances and what he is planning for the future. And above all, come back soon as we are heading into some exciting times here at his web site and between the covers of his new books. A lot has changed during the past year, more than he can keep current on his website, so he has set up a Facebook page to keep readers abreast of his position in an industry which seems to be changing every month. If you can't find something you want, or just want to ask a question, feel free to email Leigh at Leighgwood@aol.com check out the latest news on Facebook. 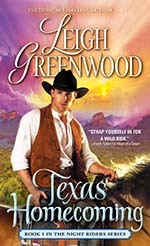 Alone in the world and struggling to make ends meet, Texas war widow Sarah Winborne will do anything to keep her two small children safe and her hard-won ranch from going under. She hasn't fought for so long to lose everything . . . and if that means marrying a stranger to protect her family's future, then so be it. She never expected anything but a business arrangement, but there's something about Benton Wheeler's broad shoulders and kind eyes. He makes her feel beautiful. He makes her feel desired. And even though their marriage was never intended to be more than a marriage of convenience, as Benton stands between her small family and the wild and dangerous West, Sarah may just realize that the cowboy she married is the love she never dreamed she would find. (a reprint) due out April 2017. She's his last chance to find peace. Cade, Captain of the Night Riders, is determined to lead his men home to Texas to recover from a long and brutal war. But when a fellow Rider betrays the team, Cade sets aside his hopes for peace and swears he will hunt down the traitor no matter what it takes. 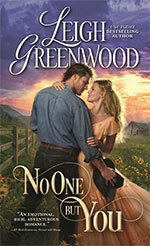 He has a foolproof plan to use the feisty Pilar diViere to lure her traitorous brother out of hiding. And yet when he takes the dark-eyed beauty into his arms, Cade can't help but remember the passionate past they shared. He would do anything for a chance to rekindle that flame.even spare her brother's life. Handsome and devilishly charming Owen Wheeler has always had a way with women-but the war has left him a changed man, and he's no longer interested in breaking hearts. Now on the trail of a fellow Night Rider turned traitor, he will stop at nothing to ensure that justice is done. There's nothing about fiercely independent-and plain-Hetta Gwynne that should make Owen long to trade his vendetta for peace, but something about her makes him feel like the man he always wanted to be. Owen can see a chance for a real future at Hetta's side...if only he could convince her to let down her guard and trust in the passion neither of them can deny.